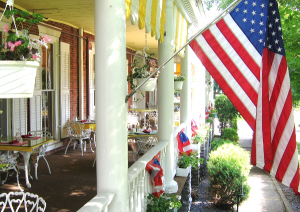 The Middlebury Inn, located on the Village Green has been welcoming travelers since 1827. 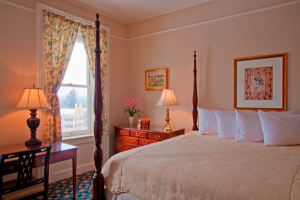 The Inn features 71 guest rooms; from historical inn rooms, traditional hotel rooms and suites in the Porter Mansion. 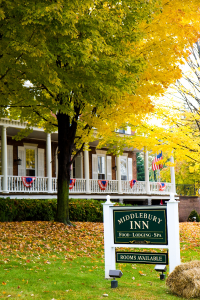 The Middlebury Inn offers the perfect blend of historic charm and the modern comforts of a full service hotel. The Inn’s Morgan Tavern and seasonal veranda feature locally sourced Vermont fare and refreshing cocktails and local beer. The Water Falls Spa offering luxurious treatments is located in the lower level of the Inn. All Packages include a Middlebury Inn Red Carpet Welcome. 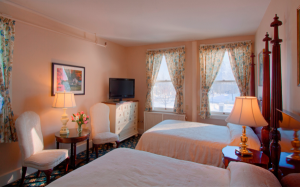 Guest Rooms include TVs, phones, irons and luxury bath amenities. Complimentary guest room turn-down service on arrival evening. Packages including Breakfast, Lunch, Dinner, Afternoon Tea, Entertainment and Spa Services are quoted upon request. The Inn’s award winning staff is available to meet your every need. Middlebury’s quaint downtown shops, restaurants, museums and attractions are within walking distance. Local attractions include Middlebury College, Middlebury Snow Bowl Ski Area, Sheldon Museum, Maple Landmark, Lincoln Peak Vineyard, Morgan Horse Farm and Danforth Pewter. 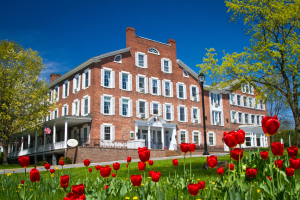 The Middlebury Inn’s central Vermont location is perfect for state wide touring.